See two beautiful British Columbia cities and their magnificent natural surroundings in California Tours’ Vancouver Vacation Package. Start in lively, lush Vancouver. Set amidst blue-green waters and snow-capped mountains, the city’s welcoming, diverse neighborhoods and year-round natural wonders make this cosmopolitan seaport a must-see destination. Take in your choice of city sights with a 48-hour “Hop On, Hop Off” tour. Vibrant shopping on Robson Street, trails and beaches at Stanley Park, Granville Island Public Market’s gourmet paradise, colorful Chinatown (the third largest in North America), and historic Gastown are just the beginning of the treasures awaiting you. A drive through the picturesque views of the Sea to Sky Highway brings you to charming Whistler, an internationally-recognized resort community, and home to the 2010 Olympic Winter Games. 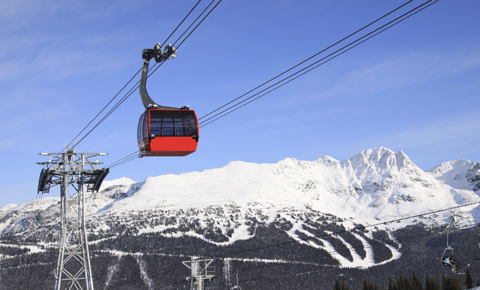 About 78 miles (125 km) north of Vancouver, Whistler is known for year-round sporting, an award-winning pedestrian village, dining, arts and culture. On your way, you’ll see the tumbling waters of Shannon Falls – the third highest waterfall in British Columbia. You’ll return to Vancouver, and enjoy another free morning in the city. A Deluxe Tour package, also available, offers a variety of upgrades and additional conveniences. Downtown Vancouver’s waterfront, near the iconic Canada Place building, is alive with walking trails and tours, shopping, historic sites, waterfront dining, and the Heritage Horns, which sound every day at noon. Gastown, Vancouver’s historic commercial core, is a fun mix of old and new. 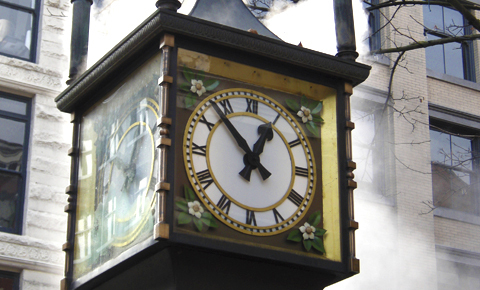 A celebrity in itself, the Gastown Steam Clock is completely powered by a steam mechanism – including its whistles! 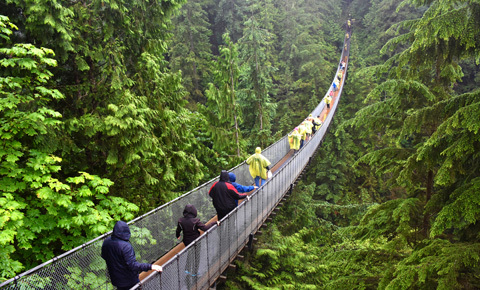 Walk across the thrilling Capilano Suspension Bridge, stretching 450 feet (137m) across and 230 feet (70m) above the Capilano River in north Vancouver. Here you’ll also find a 27-acre park with more attractions. At Grouse Mountain, “The Peak of Vancouver,” breathtaking views of greater Vancouver and the Pacific Ocean are enjoyed year-round from the Skyride, North America’s largest aerial tramway system. 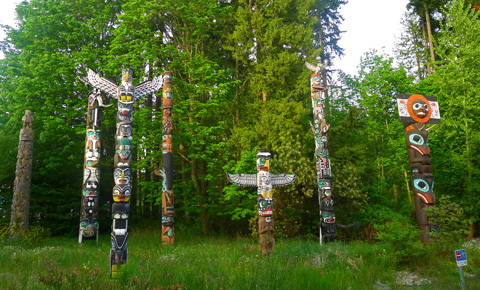 Stanley Park’s Totem Poles are a glimpse into the first nations culture of British Columbia. The urban park is a public oasis nearly surrounded by water, with many options for activity and relaxation. 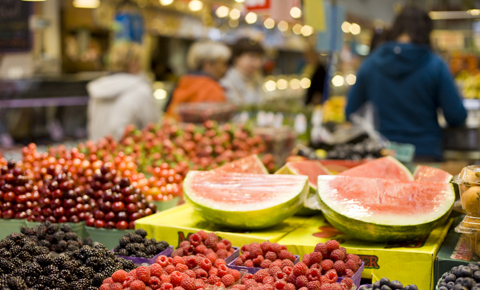 Granville Island is a favorite of locals and visitors alike. A “food lover’s paradise,” the indoor Public Market offers your choice of fresh produce and seafood, fine and casual dining, breweries, and more. 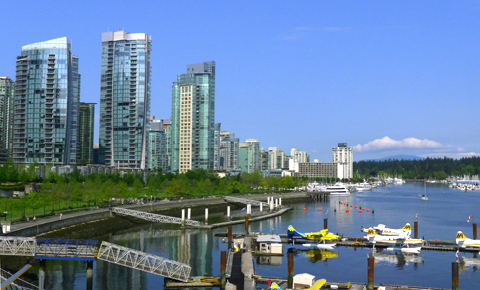 Our customizable Vancouver vacation packages include 4 night accommodations and multiple guided group tours. Take a stroll through Vancouver, and discover Stanley Park, Grouse Mountain, and experience a Whistler & Shanon Falls tour. Free time for shopping in Vancouver downtown. 48-hour Hop on Hop off Vancouver tour. Canada Place, Robson Street, Stanley Park, English Bay, Granville Island Chinatown and Gastown. 48-hour Hop-on Hop-off Vancouver tour. Full day Whistler & Shanon Falls Tour. Check out hotel by noon. Private airport transfer to hotel. Canada Place, Robson Street, Lynn Canyon, Stanley Park, English Bay, Granville Island Chinatown and Gastown. Complimentary hop on hop off tour ticket. Full day Whistler & Shanon Falls Group Tour. Check out hotel by noon. Private airport transfer. Every client receives hands-on personal attention from our professional staff with over twenty years of experience in tour operations and destination management services. We have personally been to every destination, eaten at every recommended restaurant, stayed at every hotel, and been on and collaborated with every guided tour.